Click to enlarge. A delighted girl peeks through a screen door during The Kid. While Chaplin fans packed theaters worldwide to watch his onscreen antics, during several scenes in The Kid you can see fans watching him onscreen as well. Here are several surprise fan cameos, thanks to the remarkable image quality of the new Criterion Collection Blu-ray release of The Kid. 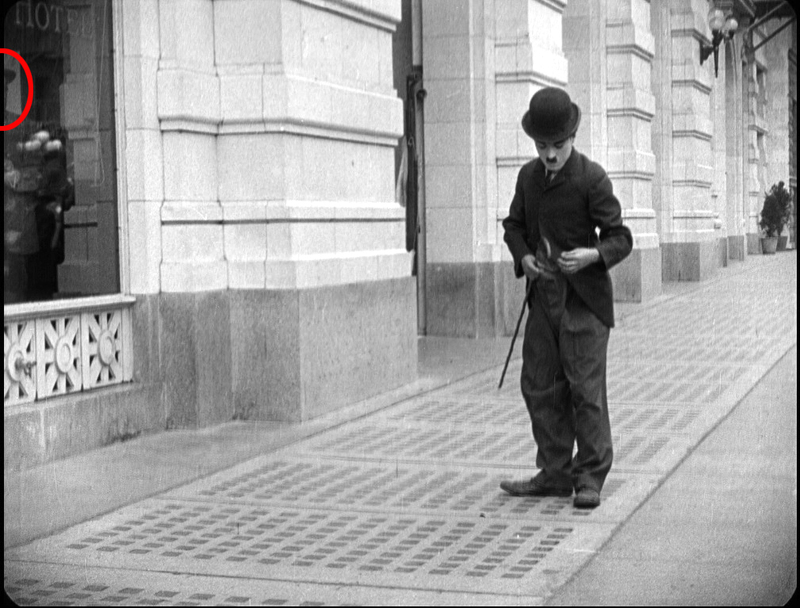 My recent post HERE shows how Chaplin made The Kid, which I explain in full detail in my book Silent Traces. This neighbor suddenly peeks over the fence as the orphanage truck travels west down Labory Lane. 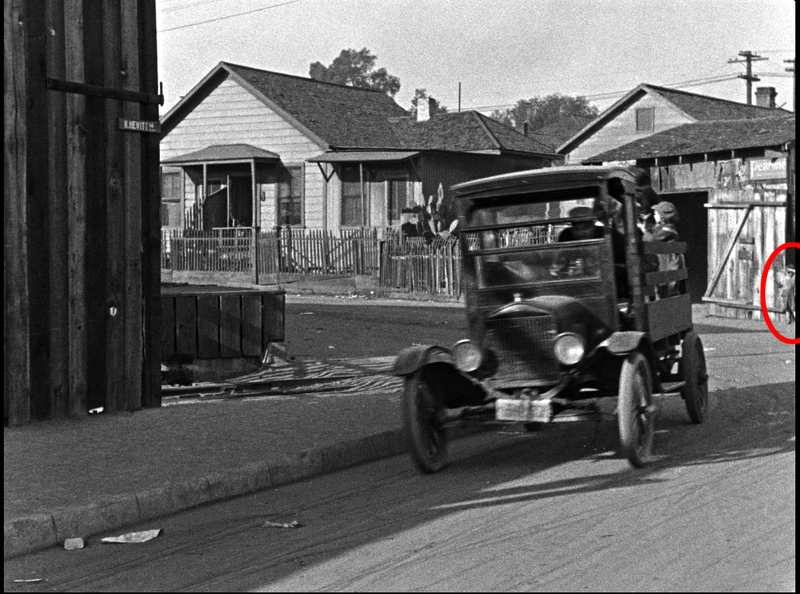 Shielding his eyes from the sun, this real-life waif watches Jackie Coogan in the orphanage truck as it turns from the east end of Labory Lane onto Hewitt. Two girls are seen here as Dan Dillon returns the foundling baby to Minnie Stearns’ stroller. 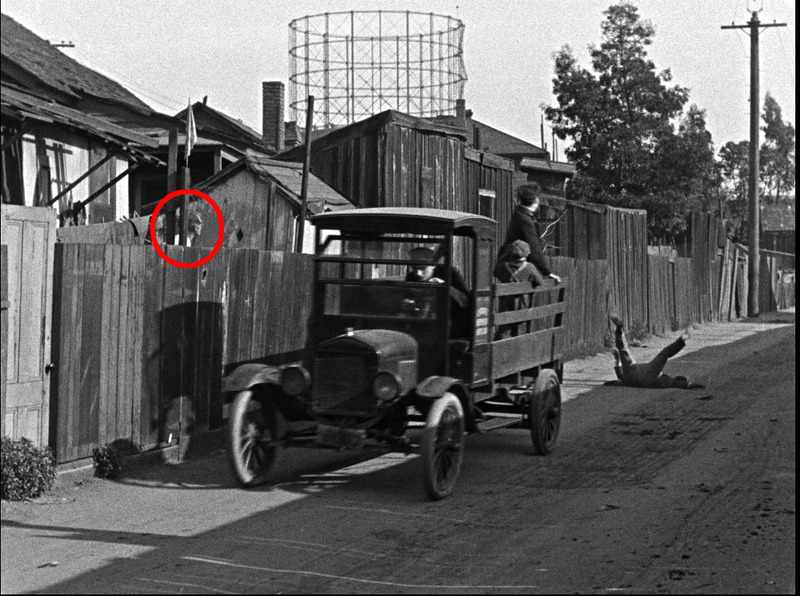 Fans made cameos in other early Chaplin films. 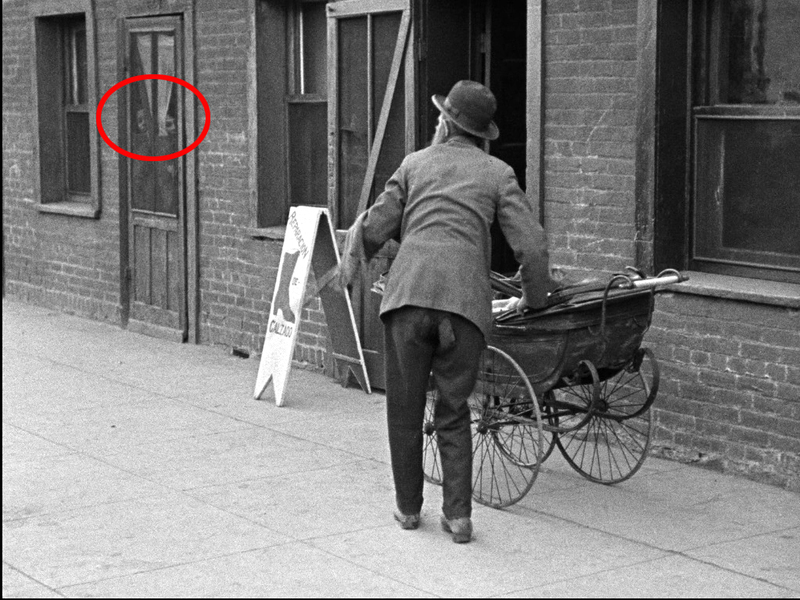 Thanks to the Blu-ray quality of the Flicker Alley release of Chaplin’s Essanay comedies, here below you can see a bystander through the window (notice his hat) during the opening scene from The Bank (1915), and further below a seaside crowd from By The Sea (1915). We’re watching Charlie, and so is the man in the hat, watching him through the window in The Bank. A large crowd gathers to watch Charlie – anticipating what will happen with the banana in By The Sea. Filmed beside the Venice Diamond Cafe at the north corner of the former Venice Plunge (indoor pool). 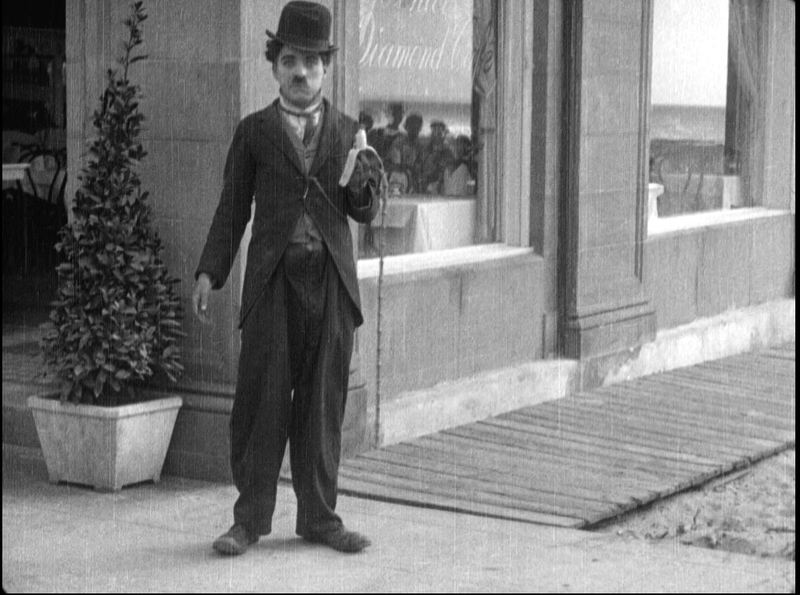 This entry was posted in Charlie Chaplin, The Kid and tagged Chaplin Locations, Charlie Chaplin, Silent Comedians, Silent Comedies, Silent Movie Locations, Silent Movies, The Kid, then and now. Bookmark the permalink. So fun! I’m really looking forward to the Blu-ray. Woo-hoo! Hi John! I’m also John (João), from Brazil. Just saw your article about Chaplin’s onscreen fans. 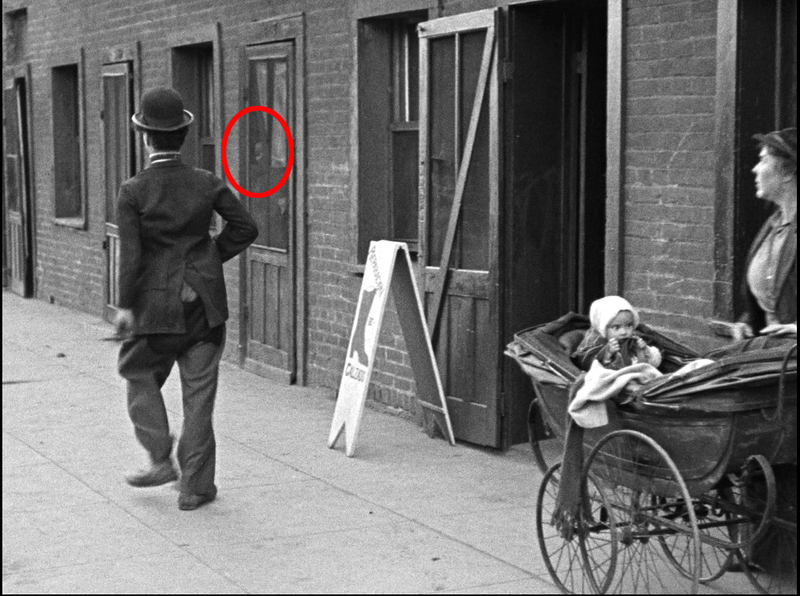 To point one, in “By The Sea”, you can see some people watching the scene trough a reflection in the window behind Charlie, right in the beginning of the film. Could you accept me o FB? Many thanks! Good work as always John! Sure we do! Here in Brazil 90% of the population loves Chaplin, you have no idea, haha. Best wishes! I have a question., why the shoe repair sign is in spanish??!! I never realized untill now I see this pictures., is very interesting. This shoe repair scene was likely filmed near the Plaza de Los Angeles, the City’s birthplace, and which retained its Hispanic heritage. As Buster runs down Arcadia St (now lost) during “Cops” you can see a large “Casa Dental Mexicana” sign behind him. Very interesting! !, thanks a lot for your answer!! Were they bystanders or unpaid, method-acting extras? Seriously though, thanks for a fun post. It’s good to be reminded these films were shot in a specific place and time, and real people witnessing them were as fascinated as we would be today. I’ll certainly be looking out for similar examples when rewatching Chaplin films now, but it’d be cool to see similar posts on Lloyd, Keaton, et al.